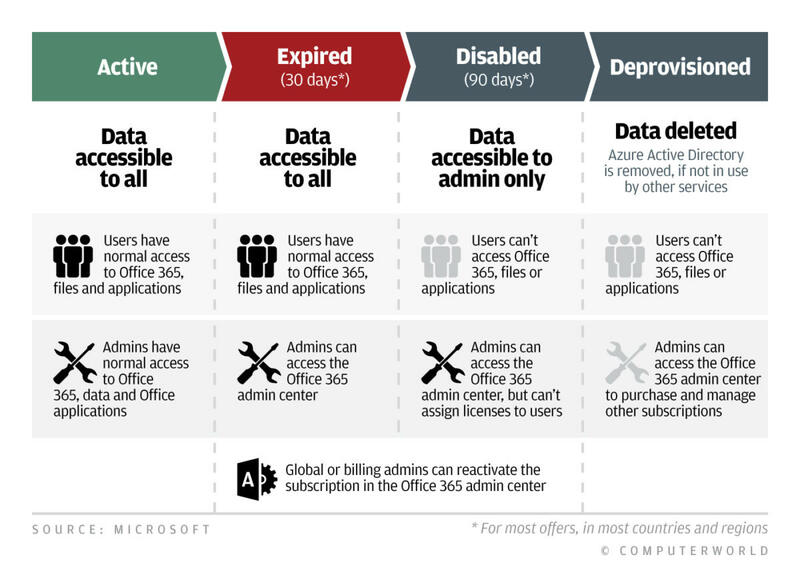 News Analysis: What happens when an Office 365 subscription expires? If you're using Microsoft's cloud-based Office 365 and the subscription lapses, here's how much time you have to renew -- or backup your data and move on. Microsoft's pay-as-you-go Office 365 is, first and foremost, a subscription. And like other subscriptions - think newspapers (remember them?) or an online storage service - missing a payment doesn't immediately mean you're cut off. Because it's less expensive to retain a current subscriber than find a new subscriber as a replacement, providers will go to great lengths to keep customers on the rolls. When a business misses an Office 365 payment, or cancels the service, the applications and data don't immediately disappear. Instead, Microsoft steps a customer through a three-stage process that gradually decreases both employee and administrator access, but for months leaves the door open to a renewal. Here are the stages of an Office 365 breakup. And for good measure, here's how to salvage a canceled subscription and get back in Microsoft's good graces. Microsoft dubs the first stage "expired," but it could just as well be called "grace period" since everything works as if the customer's payments remain up to date. Users have normal access to all Office 365 applications and services under the company's plan. Already-installed applications can be launched, no data will be scrubbed from Microsoft's servers - such as email messages or files stored on OneDrive for Business - and additional applications can be added to a user's devices. Note: macOS versions of Office provided via an Office 365 subscription do not include the 30-day grace period; they immediately enter the "Disabled" state. See below for details. During months two through four, the subscription sits in the "disabled" state. Another label could be "admin only," as administrators can continue to access the admin portal. The IT staff can most effectively use this period to back up employee data stored on Microsoft's servers. Admins cannot assign licenses to workers during the 90 days. Users are unable to log into their Office 365 accounts and so are blocked from Office 365 services included in the plan, ranging from hosted email to OneDrive for Business. The locally-installed applications will drop into what Microsoft calls "reduced functionality," meaning that most features and tools are unavailable. Files may be opened, viewed and printed, but not edited or saved. The applications may not launch from the desktop, but they will open after clicking on an appropriate document. At the Day 121 mark, the Office 365 subscription is not only dead, it's really, really dead. In fact, Microsoft will begin to delete the subscription's data from its servers starting on this date. The company does not provide a done-by deadline, saying, "You can expect data to be permanently deleted in a reasonable timeframe after the 120 days have elapsed." Enterprises that want data erased as soon as possible may request "expedited deprovisioning" by calling support. Microsoft will then issue a "lockout" code, which IT then enters in the admin portal. Microsoft then deletes the pertinent data, documents and mailboxes. Expedited deprovisioning, says Microsoft, "ensures your users' data is deleted within 3 days." Although it may seem impossible to miss the message about a soon-to-expire Office 365 subscription -- Microsoft duns customers with a flood of email as the date approaches and the admin portal also gets in on the act -- there may be instances when things slip through the cracks. Cloud resident Office365 is a luxury most Office users don't need. Or may I say, probably most typical Office users won't rush to get an Office 365 license?